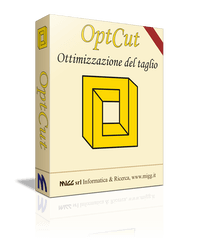 OptCut is a software for automatic optimization of linear and/or rectangular cut plan of rolls, bars, pipes, panels, profiles, plates, frames, beams, coils of different materials such as: glass, wood, sheet metal, plastic, marble, metal, aluminum, steel, cardboard, plexiglas, polycarbonate, etc. OptCut is particularly suitable to production companies such as furniture manufacturers, joiners, marble workers, glassworks, etc. but also to businesses that distribute small pieces purchased materials in standard sizes. The first objective of the program is to minimize scraps allowing substantial savings in material and gains in productivity. The program, starting from the available materials, from pieces to manufacture, and technical restrictions (blade thickness, possible rotations, machine limits etc. ), quickly and automatically generates hundreds of solutions and between these chooses best optimization based on the priorities set (less waste, number of attempts, number of panels to be used etc. ); the cut plan may also contain a large number of pieces and on sheets of different sizes. Also if for each panel is inserted the material cost, the edging cost and manifacture cost (cutting cost or other costs) the program allows you to do the cost analysis of the job. the costs analysis of orders. the availability of leftover materials. 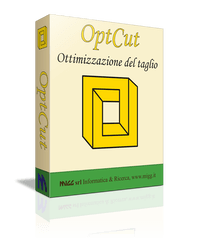 OptCut comes with an optional Import/Export module for importing materials in stock and data relating to orders with the pieces to be produced to allow a fast and correct loading; ithe module also allows you to export the data of the cutting plane both in DXF format which in text format (txt, csv) to be easily imported by CNC cutting machines. Do you want to know if OptCut meets your needs? Choose the one best suited to your business and discover the benefits! Included in the price, you are provided with a FREE package of ASSISTANCE to use in 12 MONTHS after purchase, without NO RENEWAL REQUIREMENT after expiration. For special requirements or customization of the program please contact us at our contact details. Scrap cost setting, cost of cutting, material cost, refill, minimum billable. Relative placement constraints(orientation laminate, texture). OptCut is directed at all production companies (from the small craftsman to large company) specializing in cutting and looking for software which allows them to automatically optimize the arrangement of pieces to be produced on the slabs in order to let significant savings in time and material with the possibility of reusing remainders. 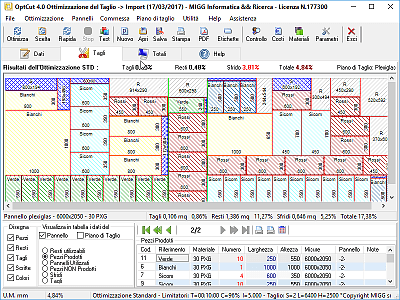 a real time-saver:Enter the dimensions of the available panels (once at load time), simply place the pieces to produce and start optimizing; automatically deploys the pieces onto the panels, calculated material requirements, processed the cutting plans, the stats, the labels, calculated cost analysis for the production of parts. a considerable material saving: built on a powerful nesting program, optimize the arrangement of pieces in order to minimize loss of material, producing cutting plans easily achievable in workshop and makes it possible to use reusable scraps. reduced set-up times: simplified programming and reduced learning time, being designed for not necessarily computer users, combines power and ease of use, infact doesn't require special training comes with a video course that allows you to use all the features of the program only after a few hours of practice; also comes with a complete user manual and easy to navigate. a better organization of work: ability to pass data optimized to cutting operators, production order management with automatic grouping of pieces to be produced, managing remainders and waste. data import/export: ability to interface with other applications used during the manufacturing process through the exchange of data in txt and csv format. the new management of Materials Table (management: priority panels, minimum size of inventories, colors and grains ..
Optimize a cutting plane has never been easier! The use of software is quick and easy! and display the processing result. After entering the optimization parameters and the materials to be used, simply enter the measurements of the pieces to be cut and then run the optimization, the optimized cutting patterns will be displayed on screen and can be printed. You can print labels to be assigned to the various parts produced. The program manages a list of materials? Yes, manages a table with the list of materials to be used, the measuresof the same and the possible price per sqm. How is it managed the grain? The grain is handled at the level of material or single piece. This is giving the material in the material list parameter "Rotation Yes” and in individual panels by inserting into column Rtz (rotation) the letter S (It means that the piece in the optimization can be rotated). What other main parameters are handled? 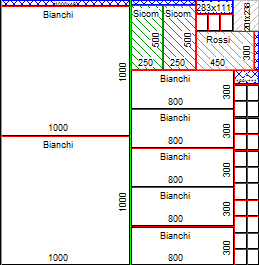 Other parameters that can be managed are: the thickness of the cut, Allowances (trimming) to manage on the Panel and on the pieces , the minimum size to be considered parts of the remains, the number of iterations, the time maximum of calculation, etc..
You can program lists with panels of different material? Yes, you can insert cutting lists composed of panels of different material, the program will automatically generate multiple optimizations with pieces of the same material. You can print your labels of the pieces to be cut? Yes, you can print labels custom pieces, as for each list contained in the table where you throw the command to print. Is it possible to know the costs of production of an order? Yes, with the module "cost analysis" you can get the price parts production. Yes. Allows interfacing with other applications used during the manufacturing process through the exchange of data in txt and csv format is inbound and outbound. To help you learn the program, please visit our Youtube channel where there are tutorials.